When describing his vision of the tree of life, Lehi said that people “did press forward through the mist of darkness, clinging to the rod of iron,” eventually reaching the tree of life (italics added for emphasis 1 Nephi 8:24). Yet one wonders why they needed to “press forward” and “cling” to the rod, if they were simply walking through a level plain on the straight and narrow path. You would think that simply running your fingers along the iron rod to avoid getting lost in the mist as you sauntered along would be sufficient. Instead, the account of Lehi’s vision suggests that the tree of life was on a hill or mountain and that people had to pull themselves up. This detail makes more sense when Lehi’s vision is compared to the Garden of Eden. This “dark and dreary waste,” according to Robert Millet and Joseph McConkie, is a “symbolic representation of fallen man in the lone and dreary world.” It is only after Lehi was brought into the “large and spacious field” that he encountered the tree and rivers. Although the words field and garden have different meanings, the Hebrew word karmel, meaning “plantation, garden-land,” is translated as “fruitful field” in several places in the King James Bible (Isaiah 10:18; 29:17; 32:15, 16). The Hebrew name Eden may even derive from a Semitic word meaning “plain,” which suggests an expansive piece of land, similar to a field. Thus, the “spacious field” of Lehi’s dream may very well reflect an ancient conception of Eden (1 Nephi 8:9, 20). The head of the river being “described as being ‘a little way off’ from the place where Lehi stands by the tree (1 Nephi 8:13–14); as with the description of the river in Genesis 2:10,” also “implies that Lehi’s location is higher than the surrounding area where the river flows.” These points all suggest that the people may have been “pressing forward” because they were pulling themselves uphill along the rod to get to the tree (1 Nephi 8:21, 24, 30). Yet Lehi’s later statement invites us to view this upward journey with optimism: “Adam fell that men might be; and men are, that they might have joy” (2 Nephi 2:25). The return to the tree of life doesn’t have to be drudgery. We can find joy in the climb. The image of Lehi’s family being present at the Tree of Life with him reminds us of this. In the Garden of Eden, Adam and Eve did not have their family with them, as they could not have children before the Fall (see 2 Nephi 2:23). Lehi, on the other hand, gathered his family around him when he was partaking of the tree of life. His vision reminds us all that the Fall was really a “fall forward,” allowing us all to have children, and eventually to be with them in the presence of God. As we make our way through life, struggling to overcome the effects of the Fall, we should remember that the Fall is what opens the path toward eternal life and therefore eternal happiness. In our upward climb, we can remember that even while we are in the process of overcoming the effects of the Fall that a fullness of joy can be found, and we can, with gratitude, make our way towards the tree of life, clinging to the iron rod. The interpretation of a flat or level plain may be inviting because Lehi twice reported that the tree of life was somewhere within or near a “spacious field” (1 Nephi 8:9, 20). However, Lehi’s description isn’t clear enough to be certain that the field, and particularly the area surrounding the tree of life, was on level ground. David Calabro noted that the “word sword was miscopied as word in the printer’s manuscript, and this reading persisted until the current edition. The reading with sword is undoubtedly correct; not only is it the earliest reading, but the phrase, “the sword of justice,” referring to God’s justice, occurs frequently in the Book of Mormon (Alma 26:19; 60:29; Helaman 13:5; 3 Nephi 20:20; 29:4; Ether 8:23). In Ether 8:23, the same phrase as in the original manuscript of 1 Nephi 12:18 occurs: “the sword of the justice of the eternal God.” In contrast, the phrase “the word of the justice of the eternal God” would be an anomaly.” David M. Calabro, “Lehi’s Dream and the Garden of Eden,” Interpreter: A Journal of Mormon Scripture 26 (2017): 272. In support of this claim, Calabro referenced Royal Skousen, Analysis of Textual Variants of the Book of Mormon, Part One (Provo: FARMS, 2004), 257–258. Joseph Fielding McConkie and Robert L. Millet, Doctrinal Commentary on the Book of Mormon, 4 vols. (Salt Lake City, UT: Bookcraft, 1987), 1:56. Other passages also associate fields with fruitfulness and luxuriance (Isaiah 32:12; Ezekiel 17:5). Francis Brown, S. R. Driver, and Charles Briggs, A Hebrew and English Lexicon of the Old Testament (Oxford, UK: Clarendon Press, 1951), 726–727; Ludwig Koehler and Walter Baumgartner, The Hebrew and Aramaic Lexicon of the Old Testament, study edition (Leiden, Netherlands: Brill, 2001), 1:792. See Genesis 2:6 and 1 Nephi 8:23–24; 12:16–17. “Although the functions are clearly different, the mist in Genesis 2:6 may correspond on some level to the ‘mist of darkness’ in Lehi’s dream.” The mist in Lehi’s dream isn’t “associated with the watering of the ground but rather with an obscuring of vision that results in the wicked becoming lost. This mist seems to be associated with the filthy river.” Thus, “the river and the mist are mentioned side-by-side in 1 Nephi 12:16–17. The Hebrew word ed ‘mist’ sounds like the word for ‘distress’ or ‘calamity,’ often used in reference to the paths of the wicked or to their fate, and it is possible that the similarity between these two words prompted a sinister understanding of the biblical mist in the context of Lehi’s dream.” Calabro, “Lehi’s Dream,” 281. See also Brown, Driver, and Briggs, Hebrew and English Lexicon, 15. Calabro, “Lehi’s Dream,” 274. See also Donald W. Parry, “The Garden of Eden: Sacred Space, Sanctuary, and Temple,” Explorations: Journal for Adventurous Thought 5 (1987): 84–85; Donald W. Parry, “Garden of Eden: Prototype Sanctuary,” in Temples of the Ancient World, ed. Donald W. Parry (Salt Lake City, UT: Deseret Book, 1994), 133–37. Compare 1 Nephi 8:31, which currently reads “and he saw other multitudes feeling their way towards that great and spacious building.” The original manuscript here read “pressing [spelled prssing] their way” instead of “feeling their way.” See Skousen, Analysis of Textual Variants, Part One, 187. See Book of Mormon Central, “Why Did Lehi Teach that the Fall Was Necessary? (2 Nephi 2:22–25)” KnoWhy 269 (February 1, 2017). @Lisa Croft - you are correct that "strait" is not the equivalent of "straight". Look up "strait" and you will find that it means NOUN 1. (used with a singular verb) a narrow passage of water connecting two large bodies of water. 2.a position of difficulty, distress, or need: Ill and penniless, he was in sad straits indeed. 3.Archaic. a narrow passage or area. 4.an isthmus. ADJECTIVE [ARCHAIC.] 5. narrow: Strait is the gate. Nowhere does it indicate something that is "straight". Disappointed there is nothing in the article about the path being "strait". Although pictures have continuously painted the path as straight, it should be noted it is NOT straight, but strait. Look is up. 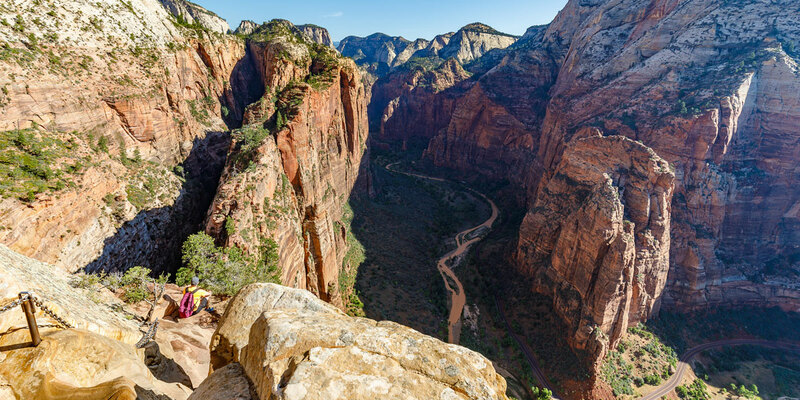 I compare this to the trail at Zion called "Angel's landing" which becomes quite dangerous and is strait (narrow) You need a rod (or chain) to hold onto at times.